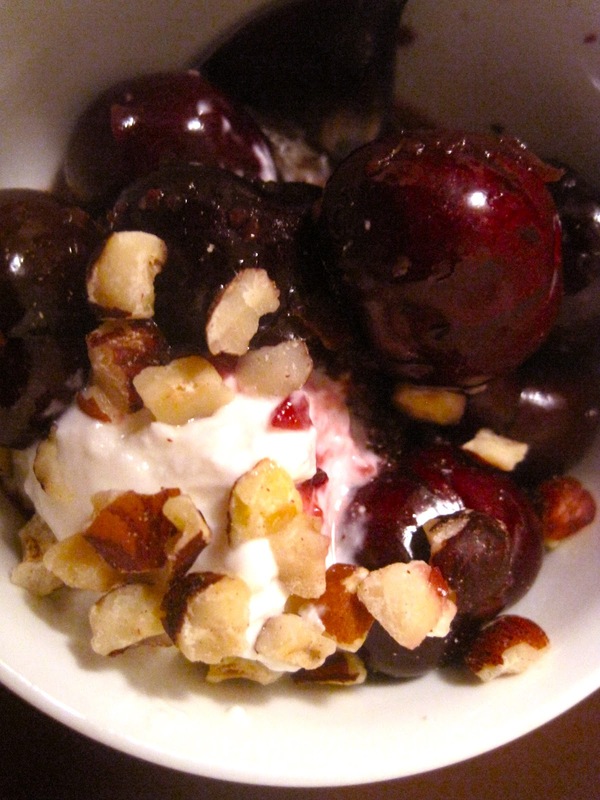 Considered by some to be the unofficial fruit of summer, cherries are in their prime right now, and this Bourbon Soaked Cherries with Greek Yogurt and Hazelnuts recipe is a sinfully delicious way to boozily celebrate their season. Simmered with brown sugar, cloves and cinnamon, the cherries envelope a rich and fragrant spiced flavor that creates a perfect harmony between sugar and spice. The bourbon cuts the sweetness so the sugar doesn't overpower. 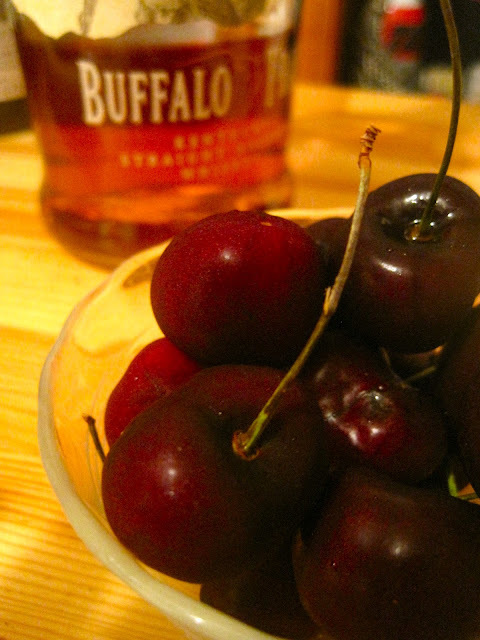 These bourbon soaked cherries can be used in a variety of ways: put the ultimate twist on a Manhattan by adding a few to bourbon's best known cocktail, or drizzle over a bowl of vanilla ice cream to top off a sweet treat. The best part: these drunken cherries are made to get better with age- so make a huge batch that will keep straight through the winter...you'll appreciate the reminder of summer when the weather cools. New research from Oregon Health & Science University found that tart cherries have the highest anti-inflammatory content of any food, and can significantly help reduce inflammation and pain for people suffering from joint paint and arthritis. Additionally, the benefits of drinking tart juice have proven valuable for athletes who may be prone to these issues as a result of strenuous joint movement. Anthocyanins- the compound responsible for cherries' bright red color- is the antioxidant keeper of this benefit. The compounds contain anti-inflamatory levels equal to those of common pain medications. Follow steps 1-3 for long-term storage. If eating immediately, only follow step 2; but add remaining 3 lbs of cherries to bourbon mixture along with the cloves and cinnamon. Let cool for 15 minutes, then spoon over greek yogurt and sprinkle with hazelnuts. 1. Sterilize 4 glass pint jars and lids (run through the dishwasher, heat in a 250 degree F oven, or submerge in boiling water for 15 minutes). Keep jars hot until ready to fill. 2. Wash and pit the cherries*. Transfer 1 lb of cherries to the bowl of a food processor and process until puréed; add to a medium stockpot with water and sugar along with whole cloves and a dash of cinnamon. Bring the mixture to a simmer over medium heat, lower heat and cook slowly until a thick syrup forms, about 15 minutes. Stir in the bourbon and keep on the heat at a very low simmer. 3. Fill hot jars with pitted cherries; tap down into the jar, but do not tightly pack; leave a generous 1/2-inch of headspace. Pour the cherry syrup-liquor mixture over the cherries, covering the topmost cherries and leaving about a 1/2-inch headspace. Remove any air bubbles with the handle of a wooden spoon; adjust headspace with additional liquid if necessary. Wipe rims, affix lids, and screw on the band to fingertip tight. Allow to rest at room temperature until the jars seal. Store in a cool, dark spot for at least 1 month before use. *If you don’t have the patience to pit all the cherries/ are sans cherry pitter (yes it exists), just pit the ¼ amount that needs to be pureed. Breyer, Melissa. "New Study Says Tart Cherries Are Highest Anti-Inflammatory Food, Can Ease Joint Pain." TreeHugger. Discovery Communications, 31 May 2012. Web.